“Kathy Casey’s Liquid Kitchen,” mixes her talent behind the bar and experience as a chef into a creative journey through great drinks inspired by the kitchen. 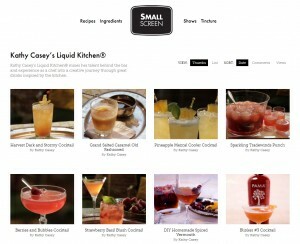 Check out Kathy Casey’s Liquid Kitchen cocktail show on Small Screen Network! Kathy Casey’s Liquid Kitchen on Small Screen Network offers an exciting opportunity to showcase your product/brand in front of a wide audience of home bar enthusiasts and bar and spirits industry professionals. If you would like to discuss sponsorship and having your product featured on Liquid Kitchen, please contact sponsor@liquidkitchen.com. Kathy Casey’s Liquid Kitchen episodes have charted hundreds of thousands of views not only on Small Screen Network, but also on YouTube, Howdini.com, and AOL!